WHERE WAS SHE, THE COUNTRY OF KHAZARIA? The problem posed in this paper was formulated long time ago by the historical geography. M.I. Artamonov asked in his book 'History of the Khazars': "Up to now we do not know the location of the most important towns of Khazaria - Itil and Semender, neither we have any their material remains. We have not found any mound of the Khazar Khagans, not even Khazarian burials. In other words, the territory of the Khazar people is not determined, even if we know quite well the boundaries of the Khazarian Khaganate." Professor Artamonov pointed out that only archaeological investigations in the Lower Volga could "lit light on questions not mentioned by the documentary sources." Indeed, in 1960-1963 the Astrakhan archaeological expedition from the Hermitage found not only richly endowed Khazarian mounds, fortresses, objects of art, etc., but it also produced a map of the lands populated by the Khazars in the 6-10-th centuries. The Khazars were numerous and rich. Their main activities were agriculture and fishing as well as husbandry. Vineyards and orchards were kept by every Khazarian clan. All this points out that the Khazars inhabited not the dry steppes, but the banks of the channels of the Volga delta. Indeed, the re-examination of the Volga banks north of Astrakhan in 1959 proved that there were no remains of Itil. But in the flood-lands, nowadays inundated in high waters , not far from the village of Selitrjanovo, were found VII-X c. pottery fragments, which were buried under 1.2 m thick river deposits. [Footnote: Itil is situated in the modern flood-lands and eroded during the XIII c. rise of the Caspian]. In 1960 in the Volga delta, on the high hill/mound of Stepan Razin, was discovered the first Khazarian burial. That gave rise to suppositions that the VII-X c. Caspian level was lower than the present one. 1 - Khazar steppes; 2 - lands inundated by the sea in the XIIIth c.; 3 - the coastal line in the VIth c.; 4 - the modern coastal line. To check it, we investigated the submerged end of the wall of Derbend, which is now 5.5 metres below the water level. Using Aqua-Lungs we found that the wall was built not on a heap/pile, but directly on a rock fundament, consisting of VI c. Sasanide rock slabs. That was technically possible to be done if only the depth was less than a man's height. That is the Caspian waters at those times were 4 metres below the present level, the Volga delta extended far further south, up to the steep deep-sea slope, and Khazaria occuppied another 50,000 km2. This was confirmed by the finds of Khazarian settlements in the Caspian sea shelf 15 km away from the modern sea-coast. In the VII-IX centuries the rich Khazaria was the Caspian Netherlands. 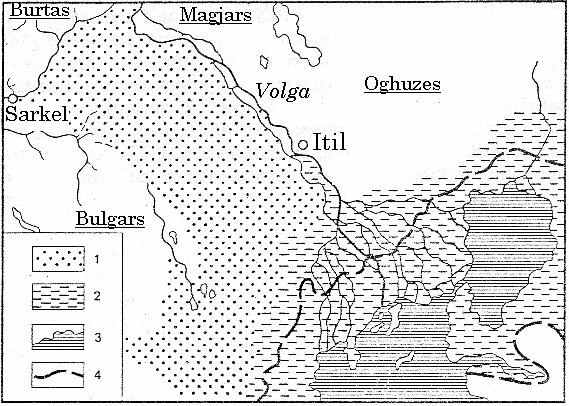 Khazarian burials are found on many mounds/hills of the central delta. Completely excavated is the burial mound on the hill of Stepan Razin. 20 burials were found, of which 5 belong to Khazars. Besides that, there are cremations from the VI-VII centuries when Khazaria was part of the West Turcut Khaganate, and also burials of nomads, allies of the Turcuts and the Khazars: Uighurs, Barsils and Pechenegs. Only a meagre part of the burials survived. This find explains why the VII c. Byzantine authors confused the Khazars and the Turcs, calling each of them with the both names. It also reveals the relations of the Khazars with their nomad neighbours. The graves of the Turcut warriors and the Khazar women and children are located in a narrow cemetery, in a single layer, but on regular intervals of not less than 1.5 metres. That could happen only if during a burial the neighbouring graves were visible. Apparently, that was the situation in the VII c. Therefore, the nomads and the Khazars not only died, but also lived in harmony together. We see not a simple penetration of nomads in the Volga delta, but their symbiosis with the local settled people. Now we understand why the Turcuts and the Khazars fought together against the Persians in Caucasus, and why the Byzantine authors confused them. ... It explains why the persecuted at home West Turcut dynasty of Ashina found refuge in Khazaria and ruled there till the beginning of the IX c.
The rise of the Caspian in the X c. and the high waters of Volga abruptly changed the conditions. First, the delta channels became navigable for shallow-draft boats and since the X c. the Russes started to penetrate into Caspian, which strained their relations with the Khazars. Secondly, the delta area shrunk. Fields, grazing grounds and fisheries went under water. People took shelter on the hills, escaping the floods. The economy of Khazaria collapsed. In the middle of the X century the Caspian level was as the modern one. This means that the Khazars lost about two thirds of their territory and their wealth. However, they could not resettle in the adjacent steppes, the domain of the war-like Oghuzes, the allies of Svjatoslav, Prince of Kiev, who in 965 AD started a war with the Khazars. The debacle could be avoided. The Russes won and went away, but the Guses occupied Khazaria for some time, which is evident from fragments of their pottery, found in the central delta. The survived Khazars asked for help from Khoresm, it was delivered at the price of a convertion to Islam. That was their salvation. When the sea raised with another eight-nine metres and flooded the remains of the Khazarian villages in the delta, and the Volga high waters did the same in the flood-lands, the descendants of the Khazars found refuge in Saraj - the capital of half of the world, and were dissolved in the enormous Golden Horde. Their Muslim faith allowed them immediately to become Tatars, as the XIII-XV c.
subjects of the khana ulus of the Dzhuchievs were called. In 1963 our investigations moved to the low-lands of Terek where we tried to find the land of origin of the Khazars. But it turned out that Khazarian monuments were found exactly on the same places where later appeared the stanitsas of the Grebenski Cossacks, the same settled stock-breeders, hunters and warriors as the Khazars. At the southern boundary of the sand dunes - the buruns - we found a lot of pottery fragments, similar to the type we found in the Volga delta. Near the stanitsa of Shelkovska is located a square citadel of a VII-X c. fortress. In the same region was located the town of Semender, the first capital of the Khazars, and as there are no other similar fortresses in the Terek valley, we conclude that it is indeed the citadel of Semender. As the ruins of Itil are now in the flood-lands of Volga, and Sarkel was populated not by Khazars but by a garrison of mercenaries-nomads, our finds are very important. We must stop thinking of the Khazars as of nomads. The geographical conditions, in which the Khazarian economy and culture took place, determine that only a settled way of life was possible, life based on orchards, hunting and husbandry.